We’re in the busiest time of the year, but things are moving along pretty well. Our pastured pigs haven’t escaped for a while. Egg production is holding steady. The local predators seem to be finding their food elsewhere. The weather is hot and dry, and the grass is browning off, but this brief excursion from Western Oregon’s trademark “cool, damp, and green” is normal. Baby Chicks in September? Seriously? Everyone thinks of springtime when they think of brooding baby chicks, but fall is my personal favorite. It’s warmer and drier, and while things get colder and wetter as fall turns into winter, the baby chicks get older and hardier before the weather has time to get bad. September and October are both good times for brooding in most climates. Why brood chicks in the fall? If you normally brood only in the spring, it’s a way to brood twice as many chicks, or twice as many kinds of poultry, using the same equipment. If you raise egg-type chickens in the spring, you can raise broilers in the fall. Or ducks in the spring and chickens in the fall. What kind of day-old chicks can you get in September and October? Commercial hybrids, mostly, though you never known until you contact the hatchery and see what they have available. That’s why we order ducklings, poults, and heritage-breed chicks in the spring; they’re available then. The rest of the year, we order commercial broiler and layer chicks. This year, we’ll start our last batch of broiler chicks around October 1, so we can have fresh broilers at the Corvallis Farmers’ Market till it ends in late November. These pastured broilers always do great in the increasingly chilly late-fall weather, because they get big fast and their high metabolism keeps them comfortable even in pasture shelters. We’ve raised pastured broilers right through the winter a couple of times, and it works fine if it doesn’t snow. If it does snow, it’s a real headache just getting feed out to them. We get meaningful amounts of snow about every other year, and that’s enough to take the shine off. We keep our broilers on a hill that’s always well-drained. On your bottom land, it would be too wet for broilers in the off-season. For egg-type pullets, we’ll start them as late as Halloween. 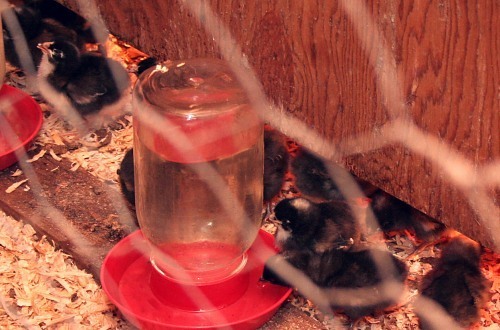 We keep them in the brooder house for as long as eight weeks, and by then they can withstand Oregon winters. I’ve written an entire book on brooding chicks (Success With Baby Chicks), with extensive chapters on off-season brooding, but the process is basically the same as spring brooding. Buy your chicks from a hatchery that’s been around a while and has a good reputation. We buy our pullets from Privett Hatchery in New Mexico and our broilers from Jenks Hatchery in Oregon. Have the brooder area completely ready for the chicks before they arrive, and turn on the heat 24 hours in advance Don’t place baby chicks on cold, damp shavings. Have a fresh bag of chick starter on hand. Baby chicks are too delicate for old feed, which may have lost vital nutrients or become musty. Don’t try to mix chicks with older poultry. They need their own space until they’re mostly grown. (That’s why you need not one chicken coop, but at least two. Why use artificial lighting for hens? It helps even out their egg production, so they lay pretty well over the winter. In years when we didn’t use lights, we’d often run out of eggs at the Farmer’s Market at 10:00 AM, sometimes even earlier, and that meant we disappointed more customers than we satisfied. That’s not a happy feeling! The lights only increase the total number of eggs per year slightly, by less than 15%. The main effect is to encourage the hens to lay more eggs year-round. They’ll lay fewer in the spring to compensate. Some people will try to convince you that using artificial lights on hens is like giving them 63 cups of coffee a day, not letting them sleep, and making them nervous and stressed all the time. That’s not hens, that’s us! When I go out to the chicken coops at night, when the lights are on, most of the hens are sleeping soundly on their perches. Makes me a little envious. September 1 is the traditional time to start using lights, and April 1 is the traditional time to stop. Fourteen hours of light a day is the traditional amount. The big commercial guys use fancier algorithms than this, but if you don’t have thousands of hens, I doubt you’ll be able to tell the difference. Last year we started using the new LED lamps, which I like better than the compact fluorescent bulbs because they’re not as fragile. We basically run many hundreds of feet of outdoor extension cords across the hen pasture, with lamps in every roosting house. Where cords connect together, we wrap the joint with electrical tape, and if necessary use a chunk of wood to keep the cord out of a puddle. This sounds pretty casual, but the connections are just as bright and clean at the end of the lighting season as they were at the beginning. In theory, we’d be okay with a 25-watt equivalent bulb for each 8×8-foot chicken coop, but we use 40-watt equivalent bulbs, just to be sure. For more details about lighting, see this article I wrote way back when, in my March 2003 newsletter. September is one of the easiest months in the poultry calendar. Start using artificial lights for consistent egg production. A bare bulb, equivalent to 60 watts for every 100 square feet of floor space, is plenty. One Survivor by Robert Plamondon. A Plotto: The Classic Plot-Suggestion Tool for Writers of Creative Fiction by William Wallace Cook.